The need for an ontological layer on top of data, associated with advanced reasoning mechanisms able to exploit ontological knowledge, has been acknowledged in the database, knowledge representation and Semantic Web communities. We focus here on the ontology-based data querying problem, which consists in querying data while taking ontological knowledge into account. To tackle this problem, we consider a logical framework based on existential rules, also called Datalog±. In this course, we introduce fundamental notions on ontology-based query answering with existential rules. 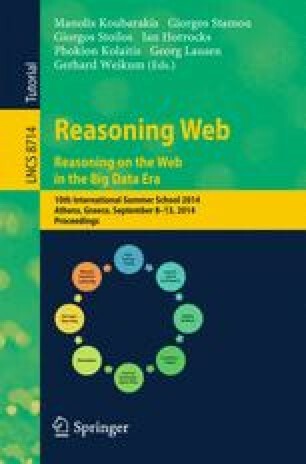 We present basic reasoning techniques, explain the relationships with other formalisms such as lightweight description logics, and review decidability results as well as associated algorithms. We end with ongoing research and some challenging issues.